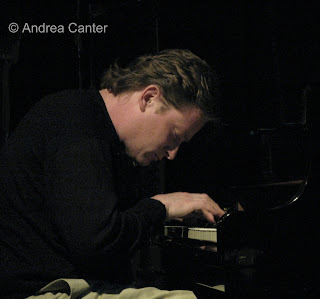 Each time I hear pianist Bill Carrothers I feel as if I have been thrown into a cyclone of jazz history. Himself a military history buff, Carrothers has also assimilated jazz from roots reaching back to the spirituals of African slaves and the cultural confluence in New Orleans through swing and bop and the current masters of the avant garde. That by itself would not really distinguish Carrothers from some other modern masters, but Bill tosses the past 100 years of influences into a few minutes of soloing in such a way that it makes perfect sense, yet never appears self conscious. He’ll interweave tradition and innovation to create multi-layered concoctions of thick, robust chords and far-reaching scales, or dissect melodies and harmonies until nothing remains but delicate, skeletal structures of exquisite irony. And always the listener is challenged to identify the process, the origins, how many standards, how many familiar theme songs, how many popular motifs can you identify before Bill moves seamlessly to the next… and how does he make it seem so musically right? It doesn’t have to be his gig or his intent; Bill will steal the show. 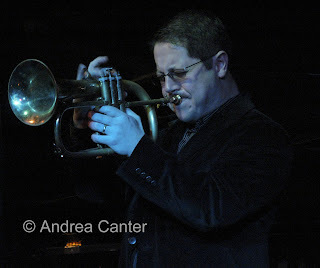 Saturday night he was billed as sideman for trumpeter Jim Rotondi, but Carrothers’ soloing, and quoting in particular, commanded center stage. “Honeysuckle Rose” bloomed within “What’s New;” Monk licks careened through “Love for Sale;” “They Can’t Take That Away From Me” diverged (with conceptual logic) into “”When I Fall in Love” and “Secret Love.” None of which is meant to negate the virtuosity of Jim Rotondi, one of the Artists Quarter’s most popular New York visitors, a hornman who can make you fall in love with the rich and mellow flugelhorn in just a few notes. Surprisingly, he’s released only one quartet recording, his new Four of a Kind (Positone Records), typically setting himself in larger ensembles such as the acclaimed One for All Sextet with saxman Eric Alexander. Yet Jim’s style seems perfectly aligned with a rhythm section alone, and at the AQ that rhythm section featured not only the ubiquitous Carrothers but the elegant and perhaps underestimated Tom Lewis on bass and the ever-playful Kenny Horst on drums. There’s no formula at work here, standards or original tunes are as likely to begin with a crash of percussion as with a tinkling of piano, bass vamp or horn verse. Rotondi gives his cohorts plenty of space to stretch out while he stands off in the shadows, returning to the stage to duel with Carrothers, ride in tandem with Lewis, debate with Horst, or encourage another solo. And if that soloist is Bill Carrothers, you have two choices. Sit back and enjoy the ride, as you will be tossed and turned amid all-out dashes across the keys, hand-to-hand somersaults from chord to chord, sweetly articulated single-line phrases and even an occasional thwang of an inside string. Or lean forward and try to follow the Iron Chef of Jazz as he grabs one ingredient after another, mixing old and new into rich stews or airy soufflés; play “Name That Tune;” and resign yourself to the realization that your ears and brain have been outdistanced again by Bill Carrothers’ flying fingers and inventive mind. Photos: (1) Bill Carrothers works over the keyboard at the AQ. (2) Jim Rotondi sings on flugelhorn. Photos by Andrea Canter, 4/5/2008.